You last visited Cynsations in June 2007! What's new in your writing life since? Well, I started teaching Writing for Children at Champlain College, and I love it. The students are all writing majors this semester. They're smart, motivated, and so interesting. And I think I'm doing my job reasonably well--by mid-terms they have gone from thinking that writing picture books might not be very hard to thinking it's one of the hardest forms there is! 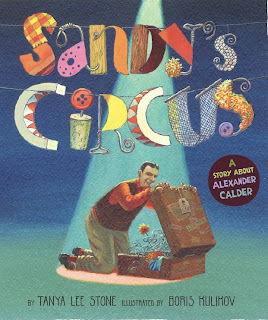 Congratulations on the release of Sandy's Circus, illustrated by Boris Kulikov (Viking, 2008)! Could you tell us a little about the book? The book begins by showing a bit about how Alexander (a.k.a. Sandy) came to be an artist, and then the bulk of the story shines the spotlight on his first major piece of work in the 1920s called the Cirque de Calder and how it blew the art world away. The Cirque de Calder is this incredibly whimsical, imaginative tiny circus that Calder made completely of found materials such as wire, cork, leather, wood, etc.. He was a big bear of a man, and the figures were quite small, and the whole circus was a performance put on by him. He would get down on his hands and knees and set everything in motion for his audience. Many of the pieces moved with clever levers and springs and such. What was your inspiration for writing this story? My dad and sister (who is now an artist and art teacher) were always taking me to museums, but I must confess it wasn't my favorite destination--until they showed me Calder sculptures and mobiles. That made a big impact on me and directly influenced my love of sculpture today. There are two timelines worth mentioning. The first is from spark to finished manuscript. That took a few years. But once I figured out how to rewrite my beginning, I was good to go. Then it was rejected a few times. Rejection is a necessary part of revision most of the time, but with this particular story, I somehow felt sure that I was going to find an editor who liked it. Second timeline. Enter the editor who liked it! 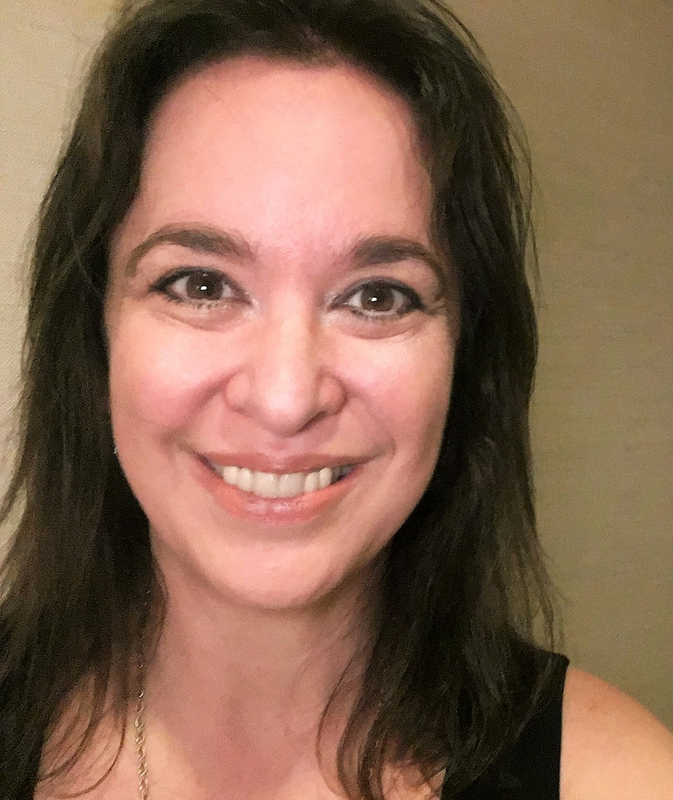 I was working on my first book with Viking (Up Close: Ella Fitzgerald (Viking, 2008)) and getting to know the wonderful Catherine Frank, my Viking editor. I don't recall exactly what sparked my mentioning the story to her, but I did, and she asked to see it. She bought it soon thereafter, Boris Kulikov quickly got on board as the illustrator, and we had a book one year later! Lightning struck! Every picture book biography has the built-in challenge of figuring out how to capture the essence of a person in under 1,000 words. What moment or aspect of someone's life does a writer want to focus on? Another challenge with Calder was how to contain such an enormous spirit in one story. The circus was the key to all of that for me, because it captures how important "play" was to him. I hope kids will see that their play matters, too, and that it can help them find their passions, lead them where they want to go. What did Boris Kulikov's art bring to your text? Oh my goodness, I can't begin to tell you how incredible his art is. I cannot imagine a better match for this text. His art is nothing less than spectacular, and he brought his own vision to the book, adding the perfect details and creating something I want to look at over and over and over again. He is so talented and has really outdone himself with this art--so much so that the usual 32 pages turned into 40! Honestly, I don't have enough space to tell you how fantastic the art is in this book. You'll all have to see for yourselves! I would like to mention, though, that one particularly nice thing about the process was that we were put in touch with each other to collaborate as needed. I was able to get him photographic material documenting Calder's life and art. We are both people who play well with others, so it was a fun experience on top of everything else! 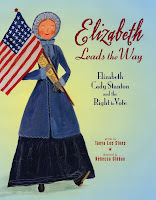 This spring you published another picture book biography: Elizabeth Leads the Way: Elizabeth Cady Stanton and The Right to Vote, illustrated by Rebecca Gibbon (Henry Holt, 2008). Who was Elizabeth, and what about her fascinated you? Elizabeth Cady Stanton was the first person to stand up and say that it wasn't right for women not to be allowed to vote. She was responsible for the first Seneca Falls Convention. In addition to her bravery and brains, what fascinated me about her was that nine out of ten people I asked didn't know who she was! I felt compelled to do something about that, frankly. What advice do you have for those writing picture book biographies? I write to learn--about concrete things such as "Who was Elizabeth Cady Stanton?" --but also to figure out how I feel and what I think about the things I'm learning. I think if a writer stays focused as much on why he or she is driven to write about a subject as the topic itself, the outcome will be infused with both a unique perspective and the writer's passion for the topic. To me, that's what goes into most of the picture book biographies I want to read. Speaking of great ladies, in January, you also published a YA biography, Up Close: Ella Fitzgerald (Viking, 2008). Why Ella? Well, for one, I'm a singer and I was raised, in part, on Ella. For another, boy, you'd be hard-pressed to name many other women who were as driven, passionate, and as intensely private as Ella. Although her music was in my bones, her life was somewhat of a mystery to me. I wanted to understand more about her and share what I learned. What were the challenges in bringing her story to teenagers? The challenges with that story mainly had to do with tracking down the truth. There have been many, many perpetuated half-truths and myths about her. Some of them were generated by Ella herself, in an attempt to sugar coat what was a pretty tough childhood and young adulthood. Others were manufactured by the media and then repeated in future articles and books. Deciphering what was fact and what was fiction took some detective work. Thankfully, I was able to enlist the help of a jazz historian named Stuart Nicholson who wrote the definitive scholarly adult biography of Ella. Looking over your bibliography, it seems to me that your fascinated by strong women. Am I right, and if so, why do you make a particular effort to speak to this theme in your own body of literature? You are right, but I can't claim to have set out to do so with direct intent. Instead, my title list does reflect my interests and attractions. I am drawn to stories about strong women or empowering young women. Perhaps it is because I feel strong myself or because I have a strong-spirited daughter or because vulnerability in girls is a trigger for me. I want to help prepare them for a world that will challenge them every step of the way, but I want to do that in a hopeful way. In a way that will make them see they don't need to be afraid but can in fact embrace those challenges and stand up for what they believe. I'm not a cynical person so, perhaps quite simply, it makes me happy to share the stories of these historic strong women with young people, both girls and boys. You are published in young adult fiction, non-fiction, and picture books. As someone who's likewise publishing across genres, I'm occasionally advised to narrow my "brand." Have you encountered such pressure? In a word: yes. But mostly in the past. I didn't listen then, and I don't get that advice much anymore. Yet as you pointed out, in a way I have unintentionally developed my "brand" as a fairly identifiable one, since I write about strong women and girls across genres. In either case, what is your take on writing in a diversity of forms to a wide range of young readers? I write about whatever is tugging at me, regardless of form. I sometimes play with form to shake things up in my brain, even if the end form changes to something else. I wrote and rewrote Almost Astronauts: 13 Women Who Dared to Dream (Candlewick, 2009) several times over--as a picture book, in poetry, in poetry and prose, and finally as prose for middle-grade and up. If you could go back in time and talk to your beginning-writer self, what would you say? 1) Did you really submit those awful picture book manuscripts? 2) Don't worry, you'll get better if you work hard enough. So far, as a reader, what are your favorite children's-YA books of 2008 and why? 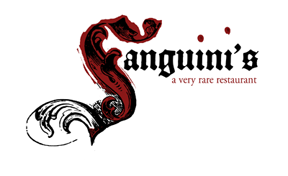 The Disreputable History of Frankie Landau-Banks by E. Lockhart (Hyperion, 2008), Chains by Laurie Halse Anderson (Simon & Schuster, 2008), and Impossible by Nancy Werlin (Dial, 2008). E. hit every note perfectly, gave us a fantastic character, a satisfying ending, and tucked a lot of philosophical and intellectual gems between the covers. Chains grabbed me on the first page and didn't let me go until the last. I did nothing but read it from the minute I started it. I didn't break for food or sleep. What more can one say? And reading Impossible was thrilling for many reasons, only one of which was that I had been privileged to have heard pieces of it in progress. So being able to finally sit down and read the whole thing from start to finish was fantastic. I couldn't stop reading this one either and it is classic Werlin: intelligent and intense! Well, in February I have two books coming out. One is my third book for the DK Bio series: Laura Ingalls Wilder (DK, 2009). That same month, I have a big nonfiction book for older readers coming out that I have been working on for several years. 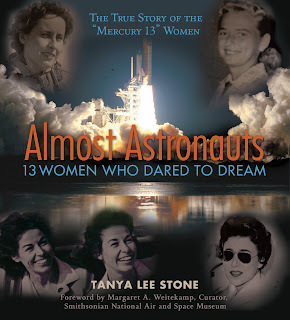 It's called Almost Astronauts: 13 Women Who Dared to Dream (Candlewick, 2009) and is about the 13 female pilots who, in 1961, took all of the same testing as our first astronauts (Mercury 7). Although they excelled, and, in some cases, did even better than the men, NASA was not ready to allow women into the space program. This is a fascinating story of a little-known episode in history that includes a Congressional hearing and some big-time American heroes behaving badly. It includes a shocking comment that Lyndon B. Johnson made to the heroine of this story, Jerrie Cobb, which captures the essence of what these "Mercury 13" ladies were up against. But you'll have to wait until February 9 to find out! I'm also working on two new books. One is a picture book about Elizabeth Blackwell called Open the Doors (Henry Holt, 2010), and she was the first female doctor in America. The other is my next nonfiction book for older readers, and it is about the history of the Barbie doll and girl culture in America. It's called Barbie: For Better, For Worse (Viking, 2010).